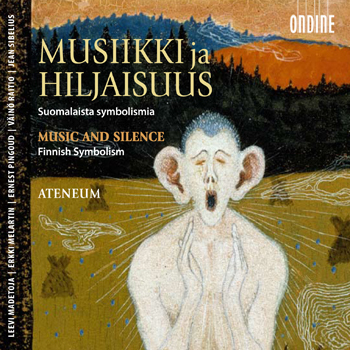 This CD was produced in connection with the Helsinki Ateneum Art Museum's 2007 summer exhibition Music and Silence. Finnish Symbolism (15 June - 2 Sept) and replaced the traditional exhibition catalogue. The contained selection of Finnish Symbolist music was played in the "music room" of the exhibition to help the visitor experience the Symbolist idea of dialogue between different forms of art, and in particular the deep understanding between music and painting in the Symbolist era. The 32-page richly illustrated booklet contains an article written by the curator of the exhibition, French art historian Laura Gutman-Hanhivaara, as well as illustrations of works from the exhibition. More information about the exhibition can be found at the Ateneum's website.